(From Canon lens literature) This new lens does what many pros thought couldn't be done - replace the previous L-series 28-70 f/2.8 lens with something even better. Extended coverage to an ultra-wide-angle 24mm makes it ideal for digital as well as film shooters, and the optics are even better than before with two Aspherical elements and a totally new UD glass element. It's now sealed and gasketed against dust and moisture, and a new processing unit makes the AF faster than ever. As anyone who's shot with one will attest (see the user reviews below), the Canon 24-70mm f/2.8 lens is just an exceptional optic. This was clearly evident in our DxO tests as well. On the sub-frame EOS-20D, the lens was tack sharp across the entire frame wide open, from 24-50mm. At 70mm, it softened slightly at f/2.8, but stopping down just to f/4.0 it was again excellent, and at f/5.6 it was superb. Chromatic aberration was moderate at 24mm, but decreased to an exceptionally low level by 35mm, and stayed very low all the way out to 70mm. Geometric distortion was low as well, changing gradually and proportionately from 0.5% barrel distortion at 24mm to about 0.2% pincushion at 70mm. (The zero distortion point came at about 45mm.) Shading (frequently referred to as vignetting) was also exceptionally low, at 1/4 of a stop wide open, decreasing to less than 1/10 stop at f/4 and above. Spending a lot of money on a lens isn't always a guarantee of good performance, but in the case of the Canon 24-70mm f/2.8, every penny of its price is more than justified. When we moved to looking at the 24-70's behavior on a full-frame camera (we tested on an EOS-5D), we had been spoiled a bit by its stellar performance on the sub-frame EOS-20D. Still, it was surprising just how well the lens handled the significantly larger frame area. Most impressive was how well it managed to hold sharpness in the corners when wide open. There was definitely more softness there than we saw on the EOS-20D, but it really wasn't bad, the corners only being notably soft at 24 and 70mm. We did find though, that we had to stop down all the way to f/8 to completely eradicate the corner softness. At f/8 though, images were just incredibly sharp across the entire frame area. As you might expect, maximum chromatic aberration increased noticeably over what we'd seen on the 20D, but here again, the 24-70 still did quite well. Maximum CA was never more than what we'd rate as "moderate" (0.06% or less) at any aperture or focal length, and the average CA was quite low across the board, indicating that the worst of the CA was confined to the edges of the image. Geometric distortion was higher than we saw on the 20D, but not by as much as we would have expected. Worst-case barrel distortion increased only from 0.5 to 0.6% at 24mm, while worst-case pincushion did a little worse, increasing from 0.2 to 0.5% at 70mm. Shading or vignetting was where the 24-70mm struggled the most to adequately cover the larger frame size. On the 20D, shading was never more than 1/4 f-stop, but on the 5D, the light falloff at 24mm and f/2.8 was on the order of 0.85 stop, a very noticeable level. The good news though, is that shading decreases fairly rapidly as the lens is stopped down, reaching a level of about 1/3 stop at f/8 at 24mm, and proportionately lower at longer focal lengths. The Canon 24-70mm f/2.8 is the first lens we've tested on a full-frame camera, so as this is written, we don't have results from other lenses to compare it with. Even without a basis for comparison though, it's clear that the 24-70mm easily justifies its price. Its one area of weakness was shading at maximum aperture: It was stellar in virtually every other attribute. Versatility, tack sharp images, color & contrast, build quality. Some say weight is an issue...I have not found it objectionable. The most used lens in my arsenal. This lens stays on my 40D most of the time. It is a great walk around lens and provides tons of flexibility when touring. I find that the image quality is superb and f2.8 speed allows for easy low light shooting. It's my Go-To lens and I've used it more than any other lens in the bag. Bought this a week ago after a month living with the inferior 24-104 f/4 L. While the f/4 approached the look of the f/2.8 at the short end, there is no contest when looking at captures from the long side. Also seems like colors and contrast are much better through the 24-70. Another thing, even though both are designated "L" series lenses, the 24-70 is much better made, using more metal and less plastic that is used on the 24-105. This lens has never let me down. It consistently produces great images. that I can endorse a lens this positively. Focus and images are very good, even wide open. It is a great lens for weddings and portraits. I use it on a 5D Mark II, a 20D and 50D but it stays on the 5D most of the time. enough for good wedding / hand / ring images. I hesitated on this verses the 24-105 F4 for the 5D but this was a good choice. It's heavy lens indeed, but I don't mind as the image quality is superb. You won't regret it. I've had this lens for two years and used in on my XT as well as my 40D. This lens lives on my camera. The images are very sharp and focus is fast and silent. People complain about the weight but I haven't had any problem with the weight. Excellent lens and worth every penny! Absolutely great lens for walking around. This is my "everyday" lens. Scenics are superb at 24mm and portraits are excellent at 70mm. I have zero issues with this lens. We all know it's an L lens, so I don't need to add to what is already known about this lens optically- & build-quality-wise. If you're fortunate enough to get a good copy of this lens you'd be amazed at it's portrait capabilities wide-open at the short tele end. It's definitely prime-level IQ to my eyes, it would even improve 1-2 stops down. It has better bokeh quality than the 24-105 f/4L IS at the same FL & aperture, even more at f/2.8. It's just too bad it doesn't have the 3-stop IS of the newer 24-105L. I actually prefer this lens over the 24-105 if only for the f/2.8 & slightly better IQ & distortion control at all comparable FLs & apertures. Fast (big aperture) lens. Great build-quality. This is really nice lens. With its f/2.8 max aperture, this is a very useful and versatile lens. It feels very well-built and quite solid. I personally tend to favor a bit more zoom than wide-angle and kept wanting to dial past 70mm. The reverse-zoom setup where the lens is shortest at 70mm and longest 24mm does take a little getting used to, but doesn't cause any major problems. The only disadvantage I'd give this lens for everyday use is its substantial weight, which is particularly evident on a Rebel body -- it weighs almost twice what the camera does! This is a monster lens. Image quality is fantastic and the solidness of the lens is very reassuring. This is a fun lens to use. The weight is worth the speed. I think it balances very well, suppose it depends on the body used. Definitely the most used lens I have. I have no problem with AF on my old D60. This is the lens I use most. Balances nicely when camera grip (with 2 batteries) is used on camera. On an APS-C DSLR it's excellent, except some AF problems with older models like 300D, 20D - on 30D/400D everything is perfect! On FF (5D) everything is perfect as well. Though some visible vignetting on 24mm at 2.8 thru 5.6 and on 70mm at 2.8. (on a full frame camera)A good travel lens covering many needs, except for obtursiveness and weight, but worth these drawbacks for the f2.8. Of course the resolution does not equal a prime lens and it is less sharp toward the corners, but I have made some great 16x20 prints from this lens. Some complain about the reverse zoom characteristic, but I welcome it as the hood is more effective and controls the mild flaring tendancy that this lens exhibits. Not remarked about often is its close focusing capability. While not a true macro, I often take advantage of close focusing distances not afforded me by other lenses. It's a great lens. Easy to use, although the 24mm end is with the lens extended, which is different from any other lens I've used. Usually you extend to zoom, but this one is the opposite. Slightly too normal/tele on a 1.6x body, but that's not the lens' fault. extension of front of lens on zoom. Great images from this lens. A little heavy but it works for a wide range of situations. Great sharpness (comparable to primes). Highly usable focal length. Super fast for a zoom. Fast accuarate focusing. Awesome construction. Simply the best zoom I have ever had the pleasure to use or own. Its fast, has a pleasant bokeh, and is built to last. I have used for portraits, weddings, and walf around. The range is great for a FF or crop camera. It gets more time on the camera than any other lens! I got both this and the 24-105/f4L since I couldn't decide which one to get. In the end, the 2.8 won out (I preferred the 2.8 over the 4 plus IS). Optically, both are practically the same, with a bokeh advantage to the 2.8L (especially, of course, at 2.8!) and somehow it just feels a tad bit better in your hands. Warning: this is one HEAVY lens. WHen you first pick it up, you appreciate the heft, but after a few minutes, your arms and shoulders will complain. It's really the big trade-off for the quality and finish of this monster. This lens is simply amazing. Sharp, fast and quite a useful range even on my 30D. It's heavy but hey, being a constant 2.8 and a pro lens to boot, that's to be expected. I was a little hesitant in buying this lens because of reports elsewhere on the web of inconsitant quality but I have been nothing but pleased. Combination of zoom flexibility with sharpness. This is my standard "walk around" lens and I keep it on my 20D until the photo situation calls for something different. My copy of the 24-70L shows clear softness at f2.8 at both 24mm and 70mm when compared with a prime like the 50mm f1.4 or the 135L f2.0. Stopping down to f4 helps a lot and sharpness is excellent by f5.6. I will avoid using when f2.8 is required whenever possible. Nonetheless, for a zoom lens the image quality is exceptionally good. When I was shooting in some dusty, windy environments I did get some grit underneath the manual focusing ring that made it difficult to operate and that disappointing weather sealing is why I lowered my rating for construction quality. noe really, maybe for some the weight, but i love the weight! i love this lens. i have mine on a 30D and its fantastic! i would guess when i jump to FF then it would be even better for me. its built like a tank! cant go wrong with this lens...gets my top grade! But you can't beat the best now can you? Sure Tamron and Sigma have their competition, but they don't have USM or weather sealing. Fantastic build quality. It can certainly take its knocks. It really does need the lens hood. Especially on a film or FF digital. I bought it because after years I really am convinced that a good objective is much more important than the body. I used several different objectives in this range on my 300D, 10D, 20D and at last I did have to buy this one to achieve the desired quality of my photos. On 20D it is (almost) as good as a prime, on 5D it is the best canon zoom in this range. Using a full frame body its picture quality is excellent, much better than I hoped. The 2.8 aperture on a full frame body gives beautiful background blur. It is heavy, but well balanced on 5D. I was skeptical of the mythological reputation of this lens. It really is everything people make it out to be. The AF is very fast and absolutely silent. Very good Sharpness all throughout the zoom range. Very usable wide open. Clever hood design. It is a bit heavy, but it's a 2.8 zoom. It's to be expected. If you need this zoom range and 2.8 this is your best option. Excellent image quality, great build. It is a heavy lens. This lens is on my 30D most of the time. It compliments my other Canon lenses very well, the 10-22 and 70-200 f2.8 non-IS. The image quality is quite superb. The AF is fast and with an aperture of 2.8 this lens is quite capable in low light situations. Regarding the price for this lens and other "L" lenses, you definitely get what you pay for - a solidly built lens that produces excellent images. Just a Fantastic Lens....Super SHARP...FAST...Very Fast Autofocus...Great Zoom Range....Weather Proof....Very Solid Build....This is a GREAT LENS!! This is one of my most used lenses, it is almost always on one of my bodies. Great range for walking around. It does have nacro focusing, but is not to be mistaken with a true macro lens. The construction quality gets an 8 because it is not fully internal, and the hood will fall off if bumped hard, not a huge deal but anoying for sure. I would love image stabilization on this lens but you can't win evry time. 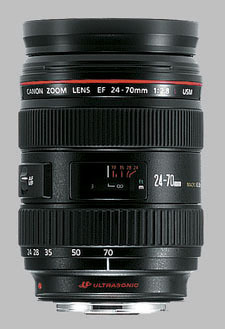 I would highly recomend this lens, especialy for PJ, and studio work. One of the things you need to get used to is that this lens extends and zooms out to 24mm (rather than zooming out to 70mm.) While I don't list this as a con, it does take a little getting used to. Image quality on par with prime lenses. This is my primary walkaround lens. Along with the 70-200L IS, it makes a perfect package. This lens is a workhorse in wedding photography and portraits. Of course it is not sharp as prime lenses, but it is a very versitile and useful lens. 2.8 is great for wedding ceremonies and receptions, a 2.8 with IS would be only better. Great color and contrast. Highly recommended along with the 70-200 2.8 IS for wedding, portraits and sports. This lens would be a dream with the IS feature, Canon are you listening? I like this lens! It stays on my 10D for anything that resembles normal focal length. If they could just add the IS to this . . .
heavy (but it depends on yours arms).